Macy’s sales have been declining amid a bigger slowdown in American retail. But now, the company is planning a new makeover. Macy’s is currently revamping its location in Columbus, Ohio at the Easton Town Center, according to the Columbus Dispatch. The company will launch this new test model on June 25. The makeover comes at a time when Macy’s is trying to get discount-addicted customers to pay full-price. A walk around its Herald Square flagship revealed a store that was in total disarray, complete with lots and lots of markdowns. 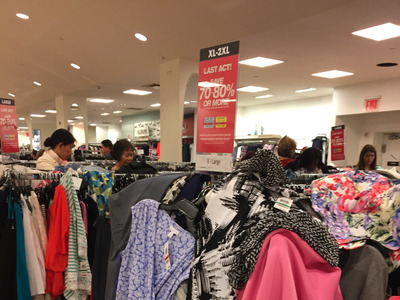 An off-price section called Last Act resembled a bargain basement. The company, like many other retailers, has been losing its premiere positioning. But now, it appears the company wants to change how people perceive it. This is the first Macy’s store that will be doing trying out this new model, and the Dispatch notes that the company will be seeing how customers respond to the changes. What they’re silently telling the company now, arguably, is that they’re not liking how things are going: sales have been down for five quarters. In the first quarter of fiscal 2016, sales fell 7.4%. “We are seeing continued weakness in consumer spending levels for apparel and related categories,” Terry J. Lundgren, the chairman and CEO of Macy’s, said in a statement. It’s no secret that consumers would rather spend on money on things other than apparel; this appears to be Macy’s way of capitalising on that.